10 people were killed in south Texas school shooting. 2 suspects have been arrested and they are believed to attend Santa Fe High School, southeast of Houston. Gunfire broke out at a Houston-area high school this Friday, May 18, in the morning, killing 10 people. 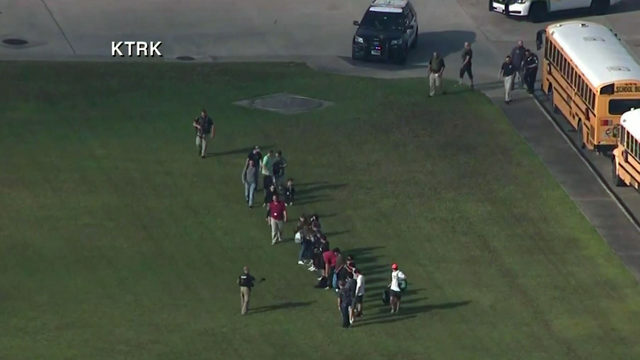 9 students and 1 teachers are reported killed authorities say. An unknown number of possible explosive devices were found at the school and off campus. A school police officer was being treated at a hospital, who was wounded by the gunfire. At least five other people were wounded. President Donald Trump expressed "sadness and heartbreak" over the shooting, and said federal officials were co-ordinating with local officials. Donald J. Trump ✔ @realDonaldTrump . "My administration is determined to do everything in our power to protect our students, secure our schools and to keep weapons out of the hands of those who pose a threat to themselves and to others," he said, speaking at the White House.